To Superbowl or NOT to Superbowl? That is the question... being posed over at 5 Minutes for Mom. They've posted some great tips to save time and money in case you're one of those people who is actually throwing a big party. I noticed some of you have great recipes posted. Tamy at 3 Sides of Crazy always has something yummy cooking. Me? The superbowl will likely be on in my house, but I am rarely seated long enough to watch a commercial, let alone the half time show or the game, so I'm sure I won't get to see more than a few minutes of it. There's always something "more important" to do - like help with homework, change the cat litter, wash clothes, clean the kitchen, plan lessons, and I could go on. So, I hope I get to see the new clever commercials, but as for watching the game, it's probably not going to happen. I am rooting for the Cardinals, however. Being from Houston back in the days of the Oilers and Bum Phillips, I would be a traitor to root for the Steelers. Besides, the mascot at the school where I teach is the Cardinal, so, Cards it is. How about you? 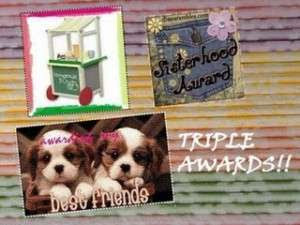 My friend Jenn gave me this triple-rific award! Thanks! This week's loyal commenter on Forgetfulone is an amazing blogger. She makes me laugh, and occasionally makes me cry. Her posts are insightful and humorous at the same time. She can take a mundane topic and turn it into something fun to read. Recently, this fabulous blogger returned from a tropical vacation, and we, her readers, are all so envious, but she soooo deserved it. Tammy at Queen Sized Funny Bone - Thanks for the laughs. And thanks for the great comments! I know I can count on you when I really need someone to be there. You're a special lady. Take your virtual crown and sash and take the walk down the runway as Bert Park sings... "There she is!" Oh, wait. That's Miss America. Well, just take your virtual crown and sash and take a walk, then! Just kidding. Trying to develop a sense of humor like yours which I admire! You're a blessing out here in blogland. I was tagged by Melanie, a designer who makes the most beautiful scrapbook pages. I'm tagged for the picture/photo tag. I've seen this before, but it's the first time I've been tagged for it. You just go to the place on your computer where you store your photos, then to the sixth folder, then to the sixth photo. Take that photo, put it on your blog and tell it's story. This is a photo my husband and I took in Williams, Arizona last summer. Williams is about 60 miles from the Grand Canyon. It's located on the historic Route 66. We saw this gas station with antique pumps and an old car, and I knew that we had to photograph it. See the really old gas pumps off to the right of the garage? And the wheelbarrow to the left. It was full of flowers. We got some close-ups of this shot as well, but this is the 6th photo in my 6th folder. Thanks for letting me share it with you. Thank you to everyone who left a comment to enter my Valentine Contest. You are full of great ideas! Unfortunately, I haven't decided the best one yet. Maybe a combination. Here are a few creative thoughts I received. Key in on what he likes and just show you care. Don't let the gift do the talking! Wani's idea was fabulous, and I may to this for Christmas. You could always take a picture of the two of you and have it turned into artwork. Can't do this now because it's cost-prohibitive. But how creative is that? Alas, my community newspaper doesn't publish announcements or messages. The Houston Chronicle does, but it's cost-prohibitive. ...who says only men can send flowers. He would definitely kill me, because not only is he unromantic, he's a very private person. I'm thinking, maybe it'd be worth it! Instead of flowers, I'm thinking a big balloon. If I don't post anything after Valentine's Day, you'll know what happened to me! Maybe the steak dinner, special dessert, sugar cookies, and some after-dinner activities will save me! Random.org helped me choose the winner, and I'd like to congratulate Charlotte from Life's a Charm! She will receive a $50 gift certificate to Tiny Prints (who I also must thank for offering the prize). Charlotte, please contact me with your snail mail info. Thanks! This is my 3rd time to participate in the NEW edition of Thursday 13! Today I am going to list 13 words that start with the first letter of my first name D. These are either descriptions of me or words on my mind at the present moment. Fairly random thoughts! I'm randoming today. 1. Dad - I miss him. It's been over 4 years since his death, but not a day goes by that I don't think of him. I still don't think I've properly grieved for him, either. 3. Daughter-in-law - My step-son is finally going to marry the mother of his twins. They are getting married in March in Vegas. Hubby and I are two of the select few invited. 4. Dependable - People with whom I have worked with on teams might describe me as dependable. I'm an efficient person who does what she says she is going to do. 5. Dowry - I had to explain this to my class today as we began reading "A Midsummer Night's Dream." I suppose it's a good thing that dowries aren't offered to men in our country. I wonder if that custom still exists in other nations. 6. Diamonds - I would like to have a small pair of diamond stud earrings. Maybe hubby will get themf or me one day. 7. Dent - I have a dent in the back of the chrome part of my 4Runner. I backed into a pole in a parking lot. My son was with me and never lets me forget it. 8. Date - With mine and hubby's hectic schedules lately, we're going to have to set up a date if we ever want to actually see each other alone any time soon. 9. Dog - the dog smells pretty bad right now. I wonder how much I'd have to pay the kids to get one of them to give him a good bath? 10. Dentist - I need to schedule dental appointments for the whole family, and while I'm there, get the name of an orthodontist for my 12 year olds. 11.Disappear - I don't understand how come spoons and forks just disappear from the house! Do the older girls use them to eat on the way to school and then leave them there? I had 12 soup spoons three years ago. Now I can find two. Ridiculous! 12. Diaper - I truly feel sorry for the woman who had 8 babies and all those diapers she is going to have to change. 13. Delicate - I always wanted to be one of those delicate women - you know the ones - delicate body, delicate hands, delicate voice, even a delicate attitude. That is not meant to be for me. Today's Heads or Tails is proudly brought to you by the word "LOUD!" We recently switched from Dish TV to Direct TV (both are satellite companies). Since the switch, I have noticed that on most of the channels we watch, the commercials are extra loud in comparison with the programs we are watching, and it drives me nuts! No one can get to the remote fast enough to turn it down during the commercials, and should we have to? I don't think so! Dish TV didn't do this to us! Direct TV does. Marketers use this purposely to capture the attention of the audience who may not want to pay attention to the commercials. Says one article, "Ask any TV station this question and you’ll get the same answer, 'the commercials are no louder than any of the other programming we broadcast — they just sound louder.'" BUT... A TV program has a mix of audio levels. There are loud parts and soft parts. Nuance is used to build the dramatic effect. I thought it was illegal to do this, but I was wrong. "The Federal Communications Commission (FCC) does not regulate the volume of programs or commercials. FCC rules limit the amount of power that a station can transmit and the peak level of the program material. Within these limitations, however, broadcasters and program producers have considerable latitude to vary the “loudness” of the program material." I was bummed when I read that at this site. If you have this problem in your area, feel free to sign the Loud Commercials Petition. Happy HoTs day! Visit other HoTties! This giveaway is closed. Joy is the winner! Congrtatulations, and thank you to everyone who entered. This is the third time I've participated in this awesome carnival of bloggy giveaway goodness. It's a great way to meet people and connect with new blogs and friends. *Memory Makers Book Titled All Kids Scrapbook Pages - over 180 fresh, new, page ideas. *Best Occasions Vellum Quote Pack Kids - 24 sheets of vellum quotes. At the end of the carnival, random.org will help me select a winner. This giveaway will run from January 26-January 30, 11:59 CST. I can only afford to send to US addresses, please. Make sure I have a way to contact you (email, blog, etc.). You do not have to be a blogger to win! All you need to do to earn one chance to win is leave a comment on this post. Simple! Extra entries - you may do any or all of the following - Leave an extra comment for each entry.1. 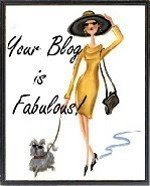 Subscribe to my blog via a reader (let me know if you already subscribe). 2. Follow my blog (let me know if you already follow). 4. Blog about this post. Don't forget to leave your link. Head over to the Bloggy Giveaways Quarterly Carnival for TONS of prizes! I am not impressed with Stephanie Meyers. I read Twilight, and thought the same thing about her writing style. I put this book down twice after I started reading it to read two other books, which I finished, but I've wanted to read The Host since it came out, so I went back to it. Not to mention I voted to read it for Reader's Anonymous. It took 200 or more pages to get into it, and it was LONG! This book was unique in some ways, predictable in others, imaginative in many ways. Overall, I would rate it good. Certainly not one of my favorites, though. This week, I want to recognize one of my loyal commenters who is also a scrapbook sister. She and I met through Sunday Scrappin'. We've become great online friends, and I would love to meet her in person one day. She is thoughtful, caring, and just plain fun! If I need help with my cricut or a design idea, I email her. If I just want to say "hey," I can email her, twitter her, facebook her. You get the picture. She always reads my blog, and she leaves comments almost all the time. Not just, "this is nice" type comments, but real comments. She's "keepin' it real." So... my very first loyal commenter is Chrissy. She has two blogs: Chrissy's Creative Spot and The World Through Chrissy's Lens. I hope you take some time to visit her! Winner to receive a $50 Tiny Prints * gift certificate! Will it be you? If you've never visited Tiny Prints, please do so. They have a new line of Valentine cards, beautiful stationery, birth announcements, notecards, birthday cards, invitations, photo cards, stickers, and so much more! They are all printed professionally on high quality stationery, and they have such a variety, you're sure to find something you love. Put your thinking cap on now. I have no idea what to do for my husband for Valentine's Day this year. He's not the most romantic guy, and he never plans ahead, just to give you an idea of what he's like. He doesn't particularly like surprises. Go figure! So, I don't want to do anything too mushy, and I don't have a lot of time to devote to this since I work and have so many other obligations. I also don't want to spend more than $30 or $40. Obviously, he'll get a card (Tiny Prints has some pretty ones!) but what else? Here's the deal. Can you come up with a unique, affordable idea for Valentine's Day? Please help me out! The person whose idea I choose will win the $50 gift certificate to Tiny Prints. Just leave your suggestion** in the comments on this post no later than January 28, 2009. One idea could get you SIX entries! See below. Extra entries - after you've left your idea, you may do any or all of the following - Leave an extra comment for each entry. 1. Subscribe to my blog via a reader (let me know if you already subscribe). 5. Visit Tiny Prints and come back here and tell me your favorite Valentine design. *If you decide to go ahead and place an order at Tiny Prints, you can receive 10% off orders of $49 or more by using coupon code TPLOVE by February 2, 2009. See details on their website. **You MUST leave an idea for me first to be entered in the contest. 1. Oh, I am so tired! 3. During spring break, I try to do something fun with the kids. Any suggestions? 4.Shakespeare with 7th graders? are you kidding me??? 5. Right now I'd like to be asleep - or on vacation. 7. And as for the weekend, tonight I'm looking forward to dinner with my husband and a bubble bath ALONE, tomorrow my plans include basketball games with the kids and a color guard contest, and Sunday, I want to visit with my mom and set up her new TV and DVD player for her as well as get organized for next week's scrapbook retreat! Visit other Friday Fill-ins or come join us! Click here! Fabulous! Tamy at 3 Sides of Crazy thinks I'm Fabulous! Thank you so much! I think she's pretty fab, too. 1. Coca-cola - I can't make it through a day without a couple of these sugary, caffeine-filled drinks. Diet just won't do! 2. Scrapbooking - I'm still learning new techniques, and I am definitely not a designer, but I love scrapping my memories. 3. Reading - I take a book with me pretty much everywhere I go. My favorite genre is mystery/psychological thriller type books, but I'm broadening my horizons. I joined Reader's Anonymous so I don't get stuck in a rut reading only the same types of books over and over. 4. Internet - I check my email several times a day, blog, read blogs, check facebook, goodreads, mom bloggers, reader's anonymous, and several other sites of this nature. 5. A few TV shows that I love but don't always get to watch and feed my addiction: Grey's Anatomy, 24, Prison Break. Now, on to five blogs that I can't miss. 1. 3 Sides of Crazy - yes, she nominated me, but I can't miss her blog! There's so much variety on it. Plus, she has great recipes. 2. Queen Sized Funny Bone - Love this blog! She's open-minded, interesting, interested, funny, and real. 3. I'm an Organizing Junkie - I get great ideas here! She does product reviews on her other blog, but she also shows many tips on staying organized, and maybe that should have been one of my addictions. I need some control in my chaotic life. 4. Sunday Scrappin' - I try to participate in this meme/blog every week. It makes me sad when I have nothing crafty to share, but I still visit everyone else and comment on their crafty items for the week. 5. Skittle's Place - There is always something fun going on at this blog! Don't wanna miss it. Real and unique. She also the creator of one of the memes I really like, Heads or Tails. Better late than never! I should be going to bed since I have to work tomorrow. But, I wanted to do this. I was only able to make one card this week with all the back-and-forth trips to the hospital. Good news! Mom came home today! I'll still have to check on her frequently since she lives in that big empty house alone. A friend is there tonight so I can work tomorrow, and my sister will be over there tomorrow. Scrapbooking is only one of the many things I haven't been able to tend to in the last couple of weeks. Let me get on with this. I wanted a black and white card for my step-daughter, and ideas were swirling around in my head for a week, then I finally just went to my supplies and did this. To do: Get ready for my scrap weekend! In two weeks, I'm going to Round Top, TX for a scrap retreat, and I'm so excited! I also still have several birthday cards to make. Join us for paper crafts, traditional scrapbooking, or digital scrapping at Sunday Scrappin'! Sisterhood, Lemonade, and Friends! Tamy at 3 Sides of Crazy gave me this sweet award, and it was such a nice surprise. Those of you who read my blog on a regular basis know how difficult the past ten days have been, and to come home to this tonight was wonderful. I'm so grateful to you, Tamy, and if you didn't already have it, I'd give it to you! Right back atcha! Thank you, everyone who has prayed for my mom. It's nothing short of a miracle. She has had so many difficulties since her surgery January 7. I can't even begin to name them all. She started coming around mentally Wednesday evening (a week after her lobectomy). She'd been in distress both physically and mentally for the whole week. We thought we were losing her. The problem that remained until today was her heart rate, which had soared. There was an irregular rhythm, an atrial flutter, not something you can live with for very long. She was scheduled for a heart shock (not the medical term, obviously), but today, shortly before being taken for the procedure, her heart returned to normal! On its own. Even her cardiologist had no explanation for it except prayer. The last 36 hours have been great. She is even being moved out of ICU to a regular room. If we can get her blood pressure to return to normal, she may come home soon. And - her doctor convinced her to have chemo (in a few weeks) which she had adamantly refused since this started. If anyone tells you that miracles don't happen, or that prayer doesn't work, I'm here to tell them they're wrong. Please keep her in your prayers for continued healing. And THANK YOU! All of my blog friends are absolutely amazing! P. S. Maybe I will have a chance to read some of your blogs this weekend. Thursday 13, Week 2 of the New Edition. MMM's the word for this Thursday 13! 1. Mom - Since she has been in the hospital for 8, going on 9, days, she has been in most of my waking thoughts as well as some of my dreams. Her recovery has been one of those "2 steps forward, 3 steps back situations." 2. Mortality - Given mom's situation, mortality has been in my thoughts a lot. Not just hers, but my own. 3. Mammogram - I had to go get one today. It was my third one in four years. That's what happens when you turn 40. Not horrible, but not fun, either. 4. Marriage - Why, oh, why did I think marriage would make anything easier? It only makes things more difficult in situations like mine where we're blending families. Sometimes I am so unhappy and have to wonder, "What was I thinking?" 5. Makeup - Putting on makeup in the morning is one of my least favorite things to do. But, since I go to work, the makeup helps my appearance. 6. Mascara - This is what I consider essential if I'm not going to do all of my makeup. At least I can do mascara and eye liner. It makes a difference! 7. Mirror - What I have to use to put on my makeup and brush my hair. 8. Mexican - One of my favorite types of food, particularly flour tortillas, cheese enchiladas, and guacamole. Yum! 9. Maid - I sure could use one. My family will help in little ways, but they really don't care if the house is clean or not, so it's left to me. I need a maid! 10. Magical - I could use some magic now, too. Wish I was planning a Magical Getaway to Disney like I was at this time last year. 11. Musuem - I would really love to see the exhibit "The Birth of Christianity" at the Houston Museum of Natural Science. We attmepted to go last weekend, but the traffic around the area was horrible, and there was no place to park... anywhere! 12. Millionaire - I'm not one, I don't know any, but I should have married one! 13. Morals - Something I feel is lacking in many young people of today. I don't know why I mentioned this. It really gets me going. I could debate about this issue all night. But since I'm out of time and have done my 13, I will pass the torch to someone else. Thanks for visiting me! Visit other Thursday 13-ers here. I thought I'd get these photos posted before I head off to the hospital this morning. This hasn't been the best week for scrapping, but I did manage to make two cards, one thank you and one get well/thinking of you. They were made in a hurry, though. I started on one of the many birthday cards I need to make, and I also started on my altered tin (part of last weeks' challenge to try something new). It's going to be a Valentine's Day gift, so I have plenty of time. Next week's Sunday Scrappin' challenge is to use stickers. I can do that. Well, I can if I get some time to scrap. There is a weeks' worth of mail to go through, a house that needs cleaning, stacks of grading and paperwork to do for school, my son's science fair project to help with, bills to pay, errands, etc. Oh, and I need to go to the hospital to be with my mom. I may not get any of the other things done, but I am going to do that now. If you are a digital scrapbooker, traditional scrapbooker, or paper crafter of any kind, please join us for Sunday Scrappin'. I want to thank everyone for their prayers, concern, and support. Please continue to pray for my mom. Wednesday - surgery day - lobectomy - surgery was successful, she came off the breathing tube right away, vitals were stable, pain was the major issue. Thursday - pretty good day - She was able to sit up, carry on a conversation, get up and walk a few steps twice, drink some water. Nausea was the major issue. Friday - started off okay, but not a good day - They moved her from the surgical ICU to the medical ICU toward the end of the day because they close the SICU when there are three or fewer patients. Whatever. Her blood pressure was too high. She began to experience some "confusion" and hallucinations. Saturday - perfectly awful day, which actually started during the night - Anemia (had to receive a unit of blood), breathing trouble (they are pushing Oxygen and pulling CO2), low sodium (big issue - I had no idea the effect of low sodium), low potassium, low pulse/ox rate, extreme agitation, hallucinations, disoriented, extremely low blood pressure (79/49), slight fever. They've had to consult the general practitioner, kidney doctor, cardiologist, pulmonary specialist, and finally, the surgeon. I was there from 2:30 until 9:15, and I'm exhausted. I hated leaving her tonight. Of course, I will be going back tomorrow. Thank you for all of your prayers. 1. It's January; Let's hibernate! 2. Sleep and comfort are what I crave most right now. 3. Cork and wine go together like bread and butter. 4.A hot bath with lavender bath soak (B&BW) is so nourishing. 5. Let us dare to dream. 6. Humble, Texas is my home because that is where I grew up. 7. And as for the weekend, tonight I'm looking forward to seeing my mom after her surgery, tomorrow my plans include my kids' basketball games and pictures, seeing my mom again on her birthday, and going to the Rockets game, and Sunday, I want to rest! Visit the Friday Fill-ins Homepage and play with us! As many of you know, I was at the hospital almost all day today with my mom undergoing surgery to remove the bottom lobe of the right lung due to cancer. Here are 13 observations about my day. 1. Hospitals stink. I mean that literally. In the entry way, I was assaulted by the scent of grape couph syrup. The floors tend to smell like a combination of Pine Sol and dirt. One of the public restrooms smelled of urine. And oxygen has a pungent odor that reminds me of the smell of new vinyl. 2. My mom has many people who love and care about her. Four friends from church arrived this morning. Two of them sat with my sister and me all day. As soon as we got to mom's house, the neighbor was at the door. She is lucky to have people who care. 3. A thoracotomy is a long procedure when it entails a lobectomy, almost three hours in the operating room alone. The rib did not have to come out, but the ribs had to be separated to get to the lung. 4. The surgical intensive care unit will allow a ratio of one nurse for two patients. 5. The hospital is not a place to be if you want to sleep. With the constant beeping of machines, sounds of medicine pumps, drains, catheters, not to mention the nurse's station and the visitors of a hard-of-hearing patient in the next cubicle, it's not likely sleep is going to come. In addition to all that, the nurses come in frequently to check heart monitors, central lines, and so on. 6. A 12 inch incision with a tube left in it to drain the area must be awfully painful, not to mention the unpleasant drainage that comes from it. It looks like she was shot in the back. 7. The nurse basically told my sister to stay away tomorrow. They will attempt to get mom up, have her cough as much as she can to prevent pneumonia, and just generally torture her with some necessary treatments. That won't keep either of us away, though. Why wouldn't they want us to be there? 8. Hospital food is inexpensive. The flipside, you get what you pay for. 9. She will be in surgical ICU as long as her doctor deems necessary, anywhere from 3 days to a week. Then she will go to a regular room to continue her recovery, which according to the doctor, is going to be difficult. 10. If I ever have to be in the ICU, I would like to have a competent, experienced nurse rather than one who is still learning the procedures. 11. There are so many germs in the hospital! I felt like I had cooties when I left. 12. We won't have any news of the prognosis until the pathology report comes back, probably two days. 13. My sister and I still get slap-happy when we are emotionally and physically exhausted, and we can make each other laugh to relieve stress. A paper surgical mask makes a great prop! P. S. Does anyone know what happened to the Thursday Thirteen home page? I can't find it anymore! I will be taking off work to take my mom for her surgery. Wednesday is the big day - This is what normal lungs should look like. Hers do not. The type of cancer she has is squamous cell carcinoma. 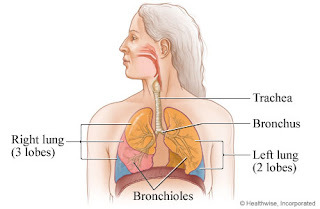 It usually starts in cells of the central bronchi, the largest branches of the bronchial tree. It is the most common type of lung cancer in men and in smokers (she's a former smoker); it is the easiest to detect early, since its distinctive cells are likely to show up in tests of mucus samples. It also tends to be most curable if found early because it spreads relatively slowly. These are things to be greatful for! She is having a thorocotomy in order to perform a lobectomy. The right lung has three lobes, and they will remove the bottom third that contains the cancer. She will still be able to breathe just fine without it once the breathing tube is removed after surgery. They may have to remove a rib if the cancer has attached itself to it, and it looks as though it may. We can expect an ICU stay of at least three days and a hospital room stay for an additional 3-5 days. She will need help with some basic functions once she is able to return home. We can also expect her to be in pain and to have chest tubes, a breathing tube, and a drain. After the pathology reports are returned, they will likely suggest chemotherapy, but she will refuse this. She's made up her mind about that. This is just a small taste of what we are going to be dealing with and what's on my mind right now. I appreciate all your prayers and kind words. There are so many great websites out there with information and support, but I relied mostly on Web MD and a friend, whose mother has been through something similar, for this post. Menu Plan Monday is sponsored by I'm an Organizing Junkie. Won't you join us? Monday - Texas Chili - It's so easy! Put chicken breasts in the crockpot. Add corn and/or black beans. Cover with Pace Picante Sauce. Turn it on in the morning, and it's ready when you get home. The chicken stays so tender. We eat it with tostadas or white rice and usually put some grated cheese on top. Tuesday - Grilled tilapia (frozen) and crunchy fish fillets for the kids. We'll have some Velveeta shells and cheese and probably carrots with this. Wednesday - I'm eating at the hospital because I will be there all day with my mom. The kids have a variety of lovely choices for dinner. Grilled cheese sandwiches and soup. Chicken tenders. Frozen lasagna. Their choice. Thursday - Grilled chicken wraps. I pan-grill the chicken in a little olive oil with some Italian seasoning. We wrap our chicken in flour tortillas made fresh in the Kroger deli by our house. Add some bell pepper, lettuce, tomato, and ranch dressing. For sides, we'll have rice and maybe green beans. Friday - I am not cooking! This is pizza night, so we will either order in or go out. Have a great week everyone! Don't forget to check out other MPM's here. Welcome to my Sunday Scrappin' post! If you're a scrapbooker (traditional or digital) or you do any type of paper crafts, please join us! I got a lot of pages (12) completed this week by keeping things simple. I've got so much to do that I realized I just have to get some of it done. I didn't use any fancy techniques or tons of embellishments. The name of the game was Get Er Dun. I participated in the 52 Sketches challege. It's the 3rd photo down, the left page. I have about 4 or 5 pages left to complete my 2001 album, then I will officially be 7 years behind on my yearly albums. I've taken breaks to do some school photo pages as well as a wedding album and a Colorado vacation, but I really need to get caught up! I am going to start on Disney and Arizona soon. I've actually done one Arizona page, but there are many to do. I need to re-organize my 2002 photos. I have to complete a thank you card to give to someone at work this week. I've already started on it. I need to make three birthday cards before the end of the month and a get-well-soon card. Since I'm back to work starting tomorrow, I won't have a lot of time. Last week's challenge was to use the rest of some supply we already had in our stash. I didn't complete that challenge because I have too much stuff! This week's challenge: Try a new technique... use a new supply... whatever you'd like, but do something that's new for you. Please pray for my mom as she undergoes cancer surgery Wednesday to remove a portion of her lung. I took my mom to see the Radio City Christmas Spectacular yesterday evening, and it was fabulous! It's not just a bunch of high-kicking girls dancing, though that is part of it. (Being a former drill-team dancer in high school and college, A LOOOONG TIME AGO, I like that kind of stuff.) But, it's a real Broadway type show with a story, actors, a ballerina, ice skaters, singing, and dancing. It was worth every penny for the good seats we had, too. There is "no photography" allowed, but there were flash cameras going off everywhere. I didn't use my flash, so a lot of my photos didn't turn out well, and there is so much movement, it was hard not to get a blurry photo, particularly when I was trying to be discreet, but I'm so glad I got some photos for the scrapbook. My sister, her husband, and my nephew met us afterwards for dinner at Spaghetti Warehouse, which was also great. That place has such character as well as good food! I hope you have time to see my slide show. Mom's birthday isn't until the 10th, but her cancer surgery is on the 7th, so we celebrated last night. I had so much fun, and I know she did, too!